Mughal dynasty is one subject of research which can excite even a man who is in his deep slumber. Right from the times of Babur to Aurangzeb and others this dynasty has always proved to be a subject of grave interest as they ruled for long and paved way for a newer India with their approach and methods. Author Ruchir Gupta in his debut novel "Mistress Of The Throne" talks about one such era in the Mughal dynasty which is probably one the most scandalizing and enlightening one too. So has he been able to shed light on it? Let's find out. 1631, the Empress of India Mumtaz Mahal has died. Yet, rather than anoint one of his several other wives to take her place as Empress of India, Mughal King Shah Jahan anoints his seventeen-year-old daughter Jahanara as the next Queen of India. Bearing an almost identical resemblance to her mother, Jahanara is the first ever daughter of a sitting Mughal King to be anointed queen. She is reluctant to accept this title, but does so in hopes of averting the storm approaching her family and Mughal India. Her younger siblings harbor extreme personalities from a liberal multi culturalist (who views religion as an agent of evil) to an orthodox Muslim (who views razing non-Muslim buildings as divine will). Meanwhile, Jahanara struggles to come to terms with her own dark reality as the daughter of a sitting King, she is forbidden to marry. Thus, while she lives in the shadow of her parents unflinching love story, she is devastated by the harsh reality that she is forbidden to share such a romance with another. 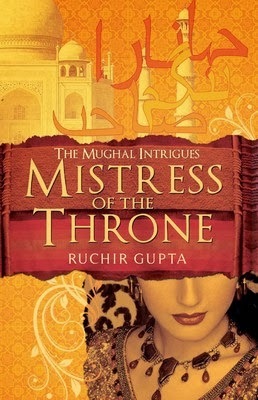 Mistress of the Throne narrates the powerful story of one of India's most opulent and turbulent times through the eyes of an unsuspecting character - a Muslim queen. It uses actual historical figures to illuminate the complexity of an era that has often been called India's Golden Age. First look at the title and the cover and the readers will be flattered. The mesmerizing image of a woman, Taj Mahal & few Urdu couplets make it a very tempting prospect for every reader. The title itself speaks volumes about the book. The blurb talks about a woman and her life during an era. It's a blurb which gives a bit insight about what to expect from the book. It could have been put in question form which could have made it more interesting. The story is of Jahanara Begum the eldest daughter of Shah Jahan & Mumtaz Mahal. It revolves around her life which starts off when her mother passes away and her father mourns deep. How she accelerates to the throne of Empress of India and from there on how she manages her father, a large dynasty, her own life, her love for someone and the top of all her brothers who make life miserable for her at each and every step. She plays a role of an empress,sister, a caring mother and a diplomat in order to restore sanctity to the struggling raj of Shah Jahan. So will she be able to prove good for the others? How will she restore order? Will there be peace ever in her life? How will Mughal dynasty hold up under her command and wit? That's what the story is all about. It's a story which people might say that they have heard over and over again but it has a different perspective to it this time in form of one of the most ignored rulers of Mughal era i.e Jahanara. Her life, her struggles, her ways and methods the entire saga unfolds in this book in the most serene manner. A beautiful insight about the life of a woman who had to sacrifice a lot in order to keep everything intact. The compelling narration along with some vivid descriptions makes it a wonderful journey. The impactful writing of the author with sheer brilliance when it comes to research is a cherry on top for the readers. There's no dull moment whatsoever in the book. The words like Aba & Ami could have been spelled with their original spellings. It was an eyesore throughout. A few pars were unnecessary in the book which could have been easily ignored. All in all it's a first hand experience of an Empress as powerful as any Mughal king. The readers will be enlightened completely at the end of this book. It's a thoroughly satisfying experience for eyes and the mind. It let's your imagination wander in times of the golden era of India.